The Air Staff promised Generalissimo Chiang Kai-shek at the Cairo Conference in November 1943 that the B-29 would be ready for combat in June of 1944 in the China-Burma-India Theatre. For the 444th this meant preparing the B-29 for combat and training crews in six months - a job that normally would have taken two years. Pilots and crews met at Tucson, Arizona, organized and several months later moved to the training base at Great Bend, Kansas. Planes were slow to arrive and, after arrival, were immediately ferried to modification centers at Omaha, Marietta, Birmingham, San Antonio, and Oklahoma City. Two weeks before departure overseas, the Group had received its full quota of airplanes which were placed in the hands of an army of civilians. They proceeded to attempt the thousands of last minute modifications directed by tech orders. Crew members stood by helplessly while these technicians sawed, hacked, and drilled their planes - and in despair viewed the inevitable results - landing gears collapsing, bomb-bay doors opening on actuation of gun switches, etc. One of the Group members aptly termed this last minute rush. "A proving ground for organized confusion." Despite the presence of over-whelming trouble and a multitude of pressing final preparations, the 444th Group planes taxied out and took off from Great Bend during the first week of April for destination - unknown. April 12, the first B-29 rolled to a smoking, brake screeching stop on a short runway in India - a place called Charra. Bewildered crews climbed out into the blast furnace heat and viewing the single short dusty runway, the bone dry rice paddies, the dark emaciated dirty natives, attempted to reconcile this scene with the reports they had heard of super luxurious B-29 bases. Fortunately, the need for becoming operational immediately absorbed most of the attention, leaving little time or energy for contemplation of the minor woes of living and operational comfort. Within a week of arrival, the planes were ready and a program of ferrying gas, bombs, food, and supplies to the forward base at Chengtu, China, was announced. 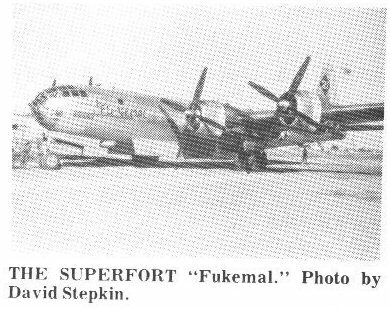 This trip necessitated a stop at Chakulia, another B-29 base for loading since Charra had neither the foremen-tioned supplies or a runway long enough to permit a heavy take off. Take offs were made early in the morning - that being the coolest time of the day (the hot rarefied air of mid-day did not provide the substance for a heavy take-off and was also conducive to engine fires). One B-29 in each of the squadrons was stripped of turrets and converted into a gas tanker and the Group entered into the "back breaking" air transport business. Jap fighters were encountered occasionally en route but were a slight menace alongside of the weather - certainly the foulest in the world's atmosphere. Lives and planes were lost flying cargo over the "Hump" - a sorry end for a trained combat crew. The violent thermals which grasped the heavily loaded B-29s like toys and threw them thousands of feet up or down were not, however, the greatest peril. Ice, the almost non-existent and much sought after commodity on the ground in torrid India, was plentiful and undesired here in this instrument pilot's proving ground. It appeared suddenly and built up rapidly, leaving the pilot prayerfully pulling full power in his attempts to hold altitude and sometimes, in final desperation, lightening the plane by salvoing his load. Often a plane would land in China with less than 300 gallons to deliver to the thirsty storage pits - sometimes, as a result of engine trouble or exceptional severe weather, a plane would be forced to refuel with a few hundred gallons in order to safely return to India. Against these often hopeless odds, the crews battled stubbornly to push across the cloud and ice wreathed "Hump" at the lowest possible altitude and minimum consumption of precious gas. At the same time the Allied Offensive in Burma was driving the Japanese continually further south, permitting us to fly on more southerly and lower altitude routes. This fact, coupled with the steadily improving maintenance and growing share of the load by ATC, gave added impetus to our supply efforts. Month by month, the stream of gas, bombs, and materials increased, permitting large scope and more frequent blows against the Japanese. Mere words are inadequate to describe the superior ingenuity, exacting care, and almost fanatical energy displayed by the engineering personnel in "licking" the manifold problems which arose in the furnace heat and drenching rains of Monsoon India and the damp piercing cold of China. These men labored with burning determination and prayerful hope in efforts to get their airlines "over the Hump" and off on missions against the enemy - and they ill concealed their mental anquish when their plane "aborted." Probably the greatest defect of the R-3350 engine lay in the constant failure of exhaust valves and vale guides on the critical top cylinders. These "swallowed valves" usually resulted in complete engine failure and often serious fires in flight. Crew chiefs learned to prevent this condition by side play checks or compression checks of the critical cylinders after each flight. Other causes of engine fires were worn ball joints and "burned out" short stacks on the exhaust collector rings (which were aptly termed a ten cent gadget on a million dollar airplane), broken off carburetor duct baffles which fell on the carburetor "air in" screens, and carburetor baffles which had a habit of vibrating loose. Resistors on the electric prop governor control often failed making it impossible for the pilot to change prop position. At times the dump valve in the base of the prop governors would fail allowing the prop to run away. Wing cell gas leaks were also quite common and usually traced to an access door in the cell itself. The lower wing panels were removed and the change effected with the aid of native bamboo as wing braces. This simple recital of maintenance troubles sounds commonplace now but at that time the solution of these difficulties was of life and death concern to the pilots and crews who flew these planes with soaring cylinder temperatures, run away props on take off, flaming and disintegrating engines with props that refused to feather in flight. During the first few months the record engine time before change was 100 hours, average take off cylinder temperatures were 290 degrees and four forced landings because of fire were accomplished in one day. At the end of four months in India, the ironic boast was that it was now a proven fact that a B-29 could be raised from the ground twice in one week without the aid of jacks. June 5, 1944 the first B-29 bombing mission was executed - against Bangkok, Siam. The offensive was on. Early in the morning the B-29s staggered into the air with vapor trails pouring off the wings. This was the beginning of the pay off for the men who had built this machine, the finest airplane on earth, and the proficiency test of the air crews who flew her. It proved to be a deadly combination. The Jap fighters discovered that they were no match for our speed and fire power. Weather prevented our planes from joining in formation and effectively bombing the target but the crews returned with high confidence in the B-29 and in their own abilities. The green light was on. The next raid, Yawata, Japan - the homeland. This was the first raid staged from the advanced base in China and the first bombing of Japan itself since the B-25 Doolittle Raid. Crew members, nervous with anticipation sat on pine benches that rainy morning in China while the Intelligence Officer announced the target and described its value and defenses. The Imperial Iron and Steel Works, producers of one-fifth of the steel for Japan's War Machine would be struck. Silence broken only by the sound of rain on the crude bamboo and mud roofs followed the dramatic announcement as each crew member considered the long distance to be flown, the unknown enemy defenses, the mechanical condition of his individual airplane, and his own reaction to the dangers and strain of the hours ahead. At the conclusion of the briefing everyone rushed out to his plane. It wasn't time for take off and everything had been double checked but they wanted to be near the conveyance that was to carry them 3200 miles over mountains, occupied territory, and open sea within the next few hours. It was nearly dusk when the first of the silver planes rolled down the muddy runway, immediately followed by the rest of the striking force facing a rendezvous with - what? The hours rolled on, each man occupied with his own thoughts until their reverie was shattered by the navigator's announcement, "One hour from the 'Initial Point.'." Soon thereafter, the radar operator reported his set working and the I.P. in sight. Radar, the gadget we had looked upon as a fancy but impractical non-workable device in the B-29 received its baptism of fire this night and showed itself to be an invaluable navigational and bombing aid. Dead ahead lay the target with searchlights stabbing upwards and B-29s shining in their piercing rays. Each plane drove into the lights and was suddenly bathed in the dazzling brightness. The night sky was filled with orange bursts from the thundering AA guns far below. Angry fighters made passes to the tune of chattering 50 caliber turrets on the 29s. Each bombardier salvoed the full weight of his bombs on the city below, the "bombs away" light flashed on the pilot's panel, and the ship dove away in a shallow turn to the right in an effort to pick up additional speed and gain the comparative safety of the China Sea. With engines purring smoothly, each crew member listening to the tail gunner's description of the inferno steadily retreating on the eastern horizon. The exciting post mortem on the bomb run completed, everyone relaxed. Cigarettes were lit, K rations broken open and canteens passed around. With the dawn, the gunners were alerted but no Japanese interception challenged the passage. As Occupied China rolled by beneath the planes, the night's efforts were clearly visible in the drawn faces and blood shot eyes of the crew. At last the snow-capped mountains surrounding the Chengtu area were visible on the horizon and at their sight, every man had visions of hot food, shower baths, and, most of all, a long uninterruped tour in the sleeping bag. This mission proved that Japan could be bombed from land bases. Systematic destruction of Japanese industry and war potential by air was feasible. The deadly raids continued: the daylight Yawata, Palembang, (the longest bombing mission in history), Singapore, Saigon, Formosa, Anshan, and Mukden were pounded by the far reaching 29s. The Jap mainland was struck again and again - Nagasaki, Omura, and Sasebo. The "lead" crew" system of bombing was adopted in September by order of General LeMay. Precision bombing results sky rocketed. Mission by mission the Superfort was proving itself, and the men who flew her had become acquainted with her every whim and foible. These men were now thoroughly indoctrinated in the harsh school of combat and they accomplished their mission with cool precision and deadly "know how." Squadrons hit the targets and withdrew in tight defensive formation bristling with coolly manned and accurately fired 50 caliber gun turrets. Flight engineers calculated their gas consumption and established power settings which returned them to base within 50 gallons of the expected 150 gallon reserve. Navigators felt their way across the uncharted and ever-changing vast-ness of China with obscure landmarks and exacting celestial navigation and terminated their 3200 mile trip by splitting the home air field. Let downs into the mountain walled Chengtu valley were effected by pilots feeling, timing, and guessing their way in the heavy soup and often severe icing on multi-split bent radio range legs through passes, over low ranges, and within the 20,000 foot west wall until successful contact was accomplished - sometimes a bare 50 feet above the ground. The men of the 20th considered these extreme operational conditions -but continued to carry on. From India bases our planes ranged down the Malay Peninsula as far as Singapore; blasting one of the Jap Navy's principal supply and repair depots and mining the Johore Channel and naval approaches. On the 3d of November the railroad marshalling yards at Rangoon, Burma, was subjected to the heaviest bomb load ever carried by individual airplanes - 40500 Ib. bombs. All formations bombed with excellent results and the target was erradicated. In tactical support of the Allied attempt to halt the Japanese winter offensive in China, the 444th ran a maximum effort with incendiaries against the warehouses and docking facilities at Hankow. Results again were excellent and a large percentage of the warehouses were completely razed, cutting off the supply of Jap armies in the south. During the invasion of the Philippines our bombs rocked the air fields of Formosa and obliterated the aircraft assembly and repair plants at Keeling Harbor, Kagi, Okayama, and Shinchiku. Formosa was the staging area for Nipponese air power en route to repel the American landings in the Philippines. On the 24th of February the King George V Dock, the largest floating dry dock in the world, was sunk at Singapore by precision bombing from 20,000 feet. March, 1945, marked the end of a year's overseas operations for the 444th - and the termination of combat operations in the CBI. The Group could not claim to have crippled the Japanese war potential or even to have inflicted damage comparable to the results of later operations in the Marianas. Nevertheless, the prime purpose of the organization had been achieved with skill and distinction - namely to combat test the B-29. The airplane had been successfully flown and maintained in the maximum extremes in temperature. Operations had been truly global in their range from Equatorial Singapore to the Polar reaches of Manchuria. Forty-five missions were completed against primary targets and over 400 enemy planes were shot down by the Bomber Command - a record of more planes shot down per sortie than any other command in the Air Force. A workable tactical doctrine had been evolved around the Lead Crew system. Finally ingenious maintenance devices and techniques had been perfected to meet our particular problems with the airplane and truly spectacular maintenance results were achieved. The Group takes well deserved pride in the fact that the hundreds of B-29s which struck Tokyo and later, in an ever growing flood overwhelmed Japan, incorporated modifications and changes which were a direct result of the selfless pioneer spirit and combat experience of the 444th.